Let me start by saying I have a tendency to be a martyr and this selfish post is a series of thoughts that I need to remind myself of regularly. Last week I went on a hut trip, something I love and used to do fairly often, yet I easily find excuses not to now that I am a husband and father. Do you know what I am talking about all you parents out there? Well Kimberly helped me overcome all those fanciful obstacles I erect in my mind and made me go. Thanks Kim! So here is what I was reminded while nestled in a cabin in the mountains. Firstly, what is a hut trip? Well most places you find mountains, snow and affluence you will come across purpose built cabins that serve as shelters for those so inclined to tour between on skis, foot or bike. In my part of the world, there is a host of them inspired by the exploits of the infamous 10th Mountain Division. Following the Second World War a number of those soldiers who returned from impactful active service in Italy set about amongst other things developing the ski industry in the US. Naturally, they were drawn back to the mountains surrounding their training base of Camp Hale near Vail. Now these gentlemen approached peace in the same way they did war; with liberal amounts of energy and determination along with a sprinkling of fun, cameraderie and an appreciation of a natural world that soothes the pains of hard work and trauma. One result is a chain of well appointed cabins, all placed in incredible situations; most are eyrie like with views to die for. They are simple and yet extremely elegant with everything you need to live comfortably and nothing extraneous. These places are magical because by removing the superfluous they are a reminder of what is actually important in life. As an indicator of how passionately we feel about that last statement, Kimberly and I were married at one. What was I reminded about? The approach to the Jackal rises straight out of Camp Hale, in the winter there is little trace of the camp that once housed 15,000 men, a host of mules and the various vehicles required to service mountain soldiers both in summer and winter. The only tell tale sign is a large artifically flat valley floor that inspires sightings of imaginary ghosts and their hustle and bustle as you ski over it. After this flat you climb and climb (from 9,000 to 11,600 ft in about five miles). 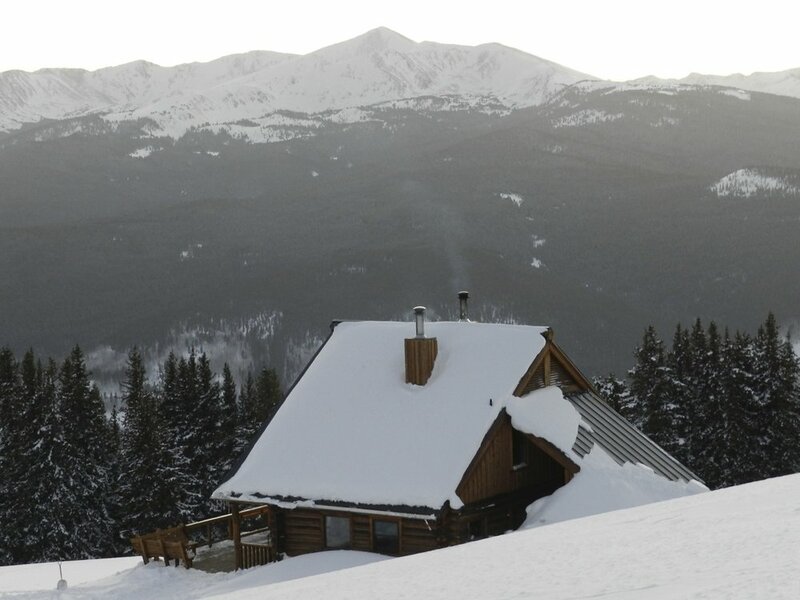 When you finally bust out of the trees there is the most gorgeous shelter, the quintessential log cabin whose windows oversee peaks throughout the Holy Cross Wilderness and the Sawatch and Mosquito Ranges. Hut life is simple. You need to cut and stack wood to keep the cabin warm and collect snow to melt for water. You get up with the sun to capture the amazing light and make breakfast. You go out to ski. You come back to make dinner and spin stories with the other people sharing the space. You take more pictures making the most of the evening light. You sit around the fire enjoying the company. Basically, it is blissful. Effort seems to be a filter when it comes to convivial company. I am yet to find someone that I have nothing in common with and whose company I did not enjoy in a remote setting such as this. I attribute this to the fact that you have to work to reach a place like this, it is a real decision. I believe being pleasant is also a choice. I hate carrying an unecessarily heavy pack and while I am prepared to invest in a few luxuries; wine and decent food seems to be worthwhile, the more I consider each item I bring, the lighter my load, the happier I am. The same is true of hut life. Ridding myself of the "stuff" from urban and work life, the lighter my load, the happier I am. Are you noticing a pattern here? When I have to climb for my turns they are more exciting, maybe its the exertion, maybe it is the variety in the snowpack that keeps me on my toes. This is the same reason why I prefer telemark over other forms of riding - it is so much more complex and takes much longer to master. When I look behind me and see an aesthetic representation of my journey I feel warm inside. Navigation is the act of matching a plan with reality and making adjustments as necessary. To "stay found" we need to know where we are, where we are going and what we are likely to meet along the way. While it is more engaging to walk where there is no map, we have to be ready to deal with the consequences. Most of the time using a map is far more efficient and means we can travel more safely and with confidence even in a place we have never visited before. Being open to changing our route as whim and the experience suggests provides more fun potential. Good navigation steers a good life. Safety is a simple formula; managing risks is about recognizing the consequence and likelihood of any action. When travelling in avalanche terrain, knowing what the snow pack consists of will give us a pretty good understanding of the consequence. We manage the likelihood by choosing the pitch we are going to ride. 38° is the angle of repose of snow, so skiing a slope of 38° means there is a high likelihood of a slide if there is something to slide and a weak layer that can fail. The thing is we have to balance the risk of loss with the risk of gain. When safe, skiing a 38° slope puts the biggest smile on my face. The time spent doing chores from which everyone benefits makes me feel part of something bigger than myself. When I can be there for someone else I feel proud. How good is that? When I allow someone else to do the same for me then I am providing an opportunity for them to feel proud. Being in wilderness is the one thing that can be guaranteed to lift my spirits and put me back in touch with myself. St Augustine said it best "solvitur ambulando" - "it is solved by walking" and this is a phrase that resonates with me. When I walk / ski surrounded by trees, birds and mountains the recovery seems to be that much more complete. Good company, good views, good simple food and sweat; the residue of a good day out, really is what life is all about. Well that is my belief anyway. Time in huts always brings it back to basics, remove computers, phones and tv and replace with conversation and a guitar, yet maintain the warmth of your home while swopping out the vista and it quickly becomes evident what we most enjoy. The family vacation by the beach, the shared Sunday meal, catching the sunrise on an early commute, the evening run through the park. These are the moments that lift us, bringing more of them into our daily life lifts our potential for happiness. What a warm fuzzy thought. Foundations & children who love what you do.